Help! We need a new game for Christmas! This post is becoming somewhat of a Christmas tradition here. Each year I tell you how much we love games, I tell you about the games we already have, and I ask for your ideas for new games to get our family for Christmas. After all, we are a gaming family. Surely we can’t survive Christmas without a new one under the tree, right? Those links are my affiliate links. We usually have 5 or more playing at the same time. Sometimes we like games we can pull out and play for just 20 minutes or so once we finally get together in the evening before bed. 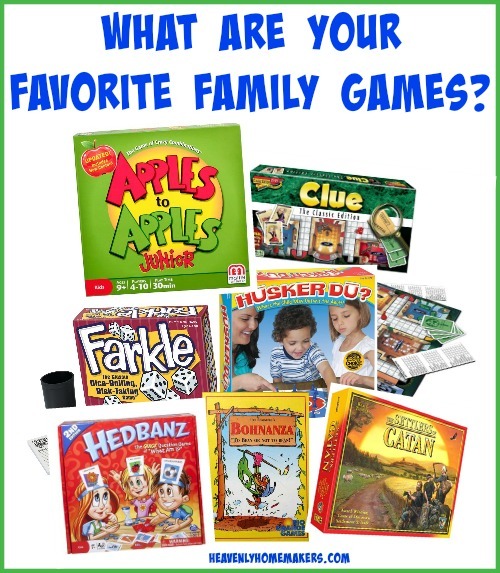 What games would you recommend for our family this year? What do you have and like? Thanks for making this so much fun every year! Codenames!! Super fun word game. Snake Oil! We received this as a present a couple of years ago and love it! King of Tokyo is great for up to six. Space team is fun fast one, also good for up to six. I second codenames for a large group. Splendor is fun and simple, but it’s only good for up to four. There are so many good games!!!! I’m sure you’ll find a good one! Loaded Questions is my favorite! It’s a fun group game and different each time depending on who is playing. Sometimes if we are short on time, we play a very abbreviated version by just going through a few cards and skipping the board game aspect altogether. Banana Grams is fun. I also like Set but not all of my family does. It seems like girls tend to be better at it than boys (at least in our experience) so you tend to win at it and make the men in your household not so happy. :-) Dutch Blitz is another family favorite. We had to get the extension set for our family of 6. We like to play a lot of games too and have many of the ones that you listed. Codenames!! It is fantastic for a group. I really like 5 Crowns. I just bought Sushi Go and it came highly recommended, but we haven’t played it yet. Our church group likes to play Killer Bunnies. It has lots of expansion packs but here is a link to the starter pack. Castle Panic is fun. Telestrations has become one of our favorites this year–it’s like the telephone game except drawn. Each round goes quickly, so it’s great for just playing for a little while, or you can do multiple rounds and keep score. P. S. – If you do get Dominion, I recommend getting a batch of the base cards to go with it. That makes it easy to play with more than 5 people. You can simply add more base cards to your game when playing with more people. If you have questions about this, please feel free to email me directly! Dutch Blitz! We love this game! Get the expansion pack when you buy it because its a great group game and its crazy fun the more people you have playing! You must try Telestrations! So much fun and laughing! There are 6 player and 8 player versions available but we got the 12 player one for when company comes. Everyone LOVES this game! My daughter played Curses at a Youth group game night and LOVES it. It’s on my list. I believe you need a bigger amount of people to play, 6 or more. The game that everyone is playing is with dental cheek retractors. You put those in and then have to say a phrase and everyone else has to guess what you are saying! It’s a hoot!!! Everyone is laughing out of control!!!! I’m not sure the name of the game but it looks hilarious! Wits and Wagers is one of our favorites. Five Crowns is also good but takes about 45 minutes+ to play. Our kids like Payday but I don’t so much because I have to pay bills in real life? Pandemic is a great game that has your group of family or friends working together to save the world from disease. Another great game is Bezzerwizzer. It’s a twist on trivial pursuit and everyone who we play with really enjoys it. There are 8 of us and we’ve also played it with friends ~ if you end up with more, you can easily partner up. We’ve recently discovered Scribblish by cranium. 4-6 players, one round takes about 20 minutes, but we have a hard time not playing more rounds! It’s sort of like the telephone game only you play it with pencil and paper. You pick a sentence on your card and draw a picture of it, then roll a dice to tell you who to pass your paper to, they look at your pic and write what they think you drew. Then you cover the pic, roll, pass, and the next person draws a pic of what the last person wrote, and it goes on a few more turns. At the end everyone tries to guess which paper is theirs. It’s hilarious to see how “Yay! I won a trophy!” turns into “A buffalo on a trampoline”. We’ve had so much fun with this game! Our new favorite is telestrations! Get it on Amazon. Bring Your Own Book! Each person picks a book to use, then tries to find the best sentence from it to fit the card prompt! Dutch Blitz and Pit are both card games and lots of fun! Dutch Blitz (with the extension pack you can have up to 8 people play) is a blast! We also like Phase 10. 7 Wonders is awesome! It takes about 30 minutes. Another great card game is Bang! Super fun party game. What about Apples To Apples Bible addition? We like the junior version and want to get the Bible one. Imaginiff, coup and pandemic are fun games! We love games as well and really enjoy Pit. Fast paced, fun, and easy enough for all ages. I don’t think anyone has mentioned these two games. This is one of our favorite and my older kids beg to play this. Skip bo we us 2 decks and I agree dominos so many games we play with them, Mexican train, and chicken feet are 2 we enjoy. I think we will go play a game now???? My family enjoys Blokus, Pandemic and Uno along with many others on your list. We love Wits and Wagers! Great for all ages, you learn lots of random, useless information, and I have adapted it to take in the car, too! Killer Bunnies is our favorite! For a shorter game we like exploding kittens. Telestrations is a super fun pictionary type game for groups. Lots of laughs!! I was surprised Rollick isn’t on your list! I think it might have been a new game last year – at least we hadn’t seen it before then. It’s a variation of Charades – good for as few as four, or a huge crowd. Divide into two teams and take turns acting and guessing – the twist is that when your team is acting, you ALL act. An opposing team member holds a deck of cards and flips them so that your whole team sees and acts out the word (or short phrase) together at the same time. When someone guesses, you move to the next card. Goal is to get as many words guessed as possible before the time runs out. Caveat: it can get LOUD! ???? If you don’t have catch phrase that is always fun to play with large groups, lots of laughs! Set is fun. My kids love a game called We Didn’t Playtest This At All. It is goofy and always generates a lot of laughs. Snake Oil is a really fun game! Greedy Dice game which all you need is a notebook and six dice (google the rules and that’s it!)! Splendor is one of our favorite games. We have many of the games you listed, so I am sure you would love Splendor. .Easy to learn and teach. I can’t remember if Puerto Rico was on your list. Qwirkle is always a favorite. Munchkin is a game that my daughter and I love. It requires reading and strategy, but you can play 3-6 and there are about 18,327 expansions for it. It’s a fight monsters/get loot type of game where it gets somewhat cutthroat at times. My wife doesn’t like it. Forbidden Island technically says 2-4 players, but I have played 5 with it and it still works fine. It’s a cooperative game where either everyone wins or everyone loses. Forbidden Desert is like a sequel to it, but it says 2-5 players. Much harder to win on that one. My 5 year old can even play it. A super fun party game that no one has mentioned is Superfight. It has a bunch of expansions that help the gameplay. It plays similar to Apples to Apples except each player puts cards out and you argue who would win in a fight. For example (and these are cards I just pulled out) Chuck Norris, but he is in a helicopter and has machine guns for arms, or Stephen Hawking who shoots lightning out of his eyes and there are 100 of him or the Genie armed with red turtle shells and is made of lava. I recommend the Green Deck expansion (G-rated, children’s characters), the Purple Deck (weird scenarios for the fights to take place in like no gravity or during a kitten stampede), and the Challenge Deck which changes it from a fight to a contest. So a radioactive T-Rex that can throw bears is a great fighter, but how strong are they at figure skating? 100 meter dash? Game of Thrones trivia? Here’s a fun short game that anyone can play: Mars Attacks the dice game. It takes about 20 minutes, is very easy to learn , and requires no reading. You take the role of the aliens and are trying to destroy cities and landmarks. Roll dice, take chances, don’t get nuked! Along those lines is Zombie Dice. You are zombies trying to eat brains. Again, no reading, lots of expansions, and is so easy my 5 year old sometimes beats me. Roll dice, get brains, don’t get shot. I keep it in my camper because it only requires the dice. Has anyone played Tsuro? If not then you should! 2-8 players, no reading, takes about 3 minutes to learn but has a lot of strategy. Just as fun with 2 as with 8! Seriously I can keep going all night on these. I haven’t even gotten to the Lord of the Rings board game. I saw it once at a Target years ago and I have never seen it since. You can score it on Amazon (https://www.amazon.com/Fantasy-Flight-Games-LTR12-Rings/dp/1589947061) and is a 2-5 cooperative game. Super fun and if you love the books you’ll really like this one. If you have any questions, email me at generalsolo@yahoo.com. Our family plays games so we have plenty of them! 2. SET (a game with cards of different shapes, colors, shades, and amounts and you have to see them and find 3 cards for a complete “set” that either have to be all the same or all different in each of the categories–super challenging and ADDICTING as you start to get quicker and quicker after lots of practice. Can be played by yourself all the way to your whole family at the same time. It’s good for the brain as it makes you think different than normal). Both faster paced fun games! I see it’s already been suggested, but I’d like to second Exploding Kittens. I just learned it over Thanksgiving! Super cute and quick game – max of 5 players, but it’s super fast to learn and you can play a hand quickly! Qwirkle for a more quiet game. Telestrations for a bit crazy fun! Last year my son got Laser Maze and Gravity Maze and loves to play them both – I like Gravity better. And Tri-ominos is always a fun classic. We like Munchkins and CashFlow 101 at our house! Scribblish is hilarious to play with a group. Deer in the Headlights. Great card/dice game. Mille Bornes! It’s a card game that my son has loved for years. They played it at school and we had to have our own copy. Sushi Go Patty – up to 8 players, great card game that goes pretty fast once you’re familiar with the cards! You linked to this in a recent email – are you looking for new games again this year? I have a whole list of recommendations for many different ages and groups ( http://www.thefamilygamers.com/holiday2017/ ), but for your family this year, I would highlight the following. All of them support 5 or more players, and play in 30 minutes or less. Windup War – a tiny game where different factions battle each other by “programming” their actions ahead of time. It can get chaotic, with certain attacks not behaving as planned.